The PCSeries: Precise OLED Stand Lamp’s name tells you all that you must know. It is a thin curved metal sheet, an OLED light panel and a little bit of concrete. Metal stream in Steel, White Rusty Steel, Brass and Old Copper. OLED means Outstanding Lighting Every Day. An OLED light panel is a thin film of material that emits light. OLED is the only technology that can create totally flat lighting panels. OLEDs emit beautiful soft diffused light – in fact OLED lighting is the closest light source to natural light (with the exception of the old incandescent lamps). Stunning light brought to you by Precise Concrete OLED Stand Lamp. OLED lighting on a concrete base, where the light flows along the blissful metal arc until it solidifies into concrete. 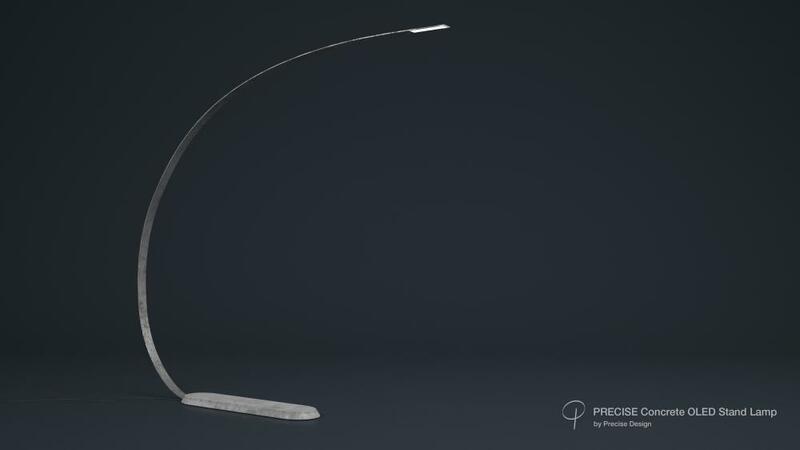 The PCSeries: Precise OLED Stand Lamp is part of the PCSeries. PCSeries (Precise Concrete Series) is the name of Precise Design’s designer home product line, which utilizes concrete as a fundamental aspect of its design. We have designed 5 different products, which we are going to produce as a limited series.